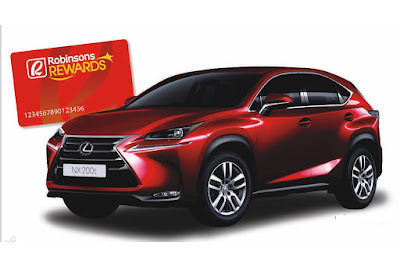 This Christmas, lucky motorists will have a chance to drive home a brand new Lexus NX compact luxury crossover courtesy of Robinsons Rewards Card each time they fuel up at Caltex. From November 15, 2016 to January 15, 2017, Robinsons Rewards members will earn one (1) e-raffle entry for every P 1,000 single-receipt purchase at participating Caltex stations and Robinsons stores nationwide. More fuel ups mean more chances to win the brand new Lexus NX 200t. The lone car winner will also get a year’s worth (P 100,000 worth of StarCash) of free Caltex with Techron fuel. Ten raffle winners will also get StarCash worth P 10,000 each and another 10 winners will receive Robinsons Gift Certificates, also worth P 10,000 each. To earn an entry, customers simply have to present their Robinsons Rewards Card upon purchase. “Chevron’s Christmas tie-up with Robinsons is another testament of its continuing thrust in strengthening relationships with its motoring clients. By tapping into its extensive partner network and sponsoring programs like the Robinsons Rewards Card Christmas Promo, Caltex ensures that loyal customers are rewarded with value-added on top of the products and services they get with each trip to our stations,” said Peter Morris, country chairman, Chevron Philippines Inc., marketer of the Caltex fuel and lubricants. Chevron offers high quality products and services, as part of its commitment to motorists’ safety. The Caltex brand was recently reformulated with the new Clean & Glide technology, which optimizes engine protection, fuel economy, and power with continued use, for a smoother motoring experience. Motorists will get the dual value of gassing up with Platinum and Silver with Techron while also contributing to lesser emissions with the Euro 4 standards that are currently being implemented. Consumers can avail of the promo at Caltex stations and Robinsons stores, including Robinsons Department Store, Robinsons Supermarket, Robinsons Selections, Robinsons Easymart, Robinsons Appliances, Handyman, True Value, True Home by True Value, Robinsons Builders, Toys “R” Us, Daiso Japan, Robinsons Specialty Stores (Topshop, Topman, Dorothy Perkins, Miss Selfridge, Burton Menswear, Warehouse, and G2000), Shiseido (stores operated by Robinsons Specialty Stores, Inc.), and Benefit (stores operated by Robinsons Specialty Stores, Inc.). Robinsons Rewards Card Christmas 2016 promo winners will be announced on February 27, 2017.